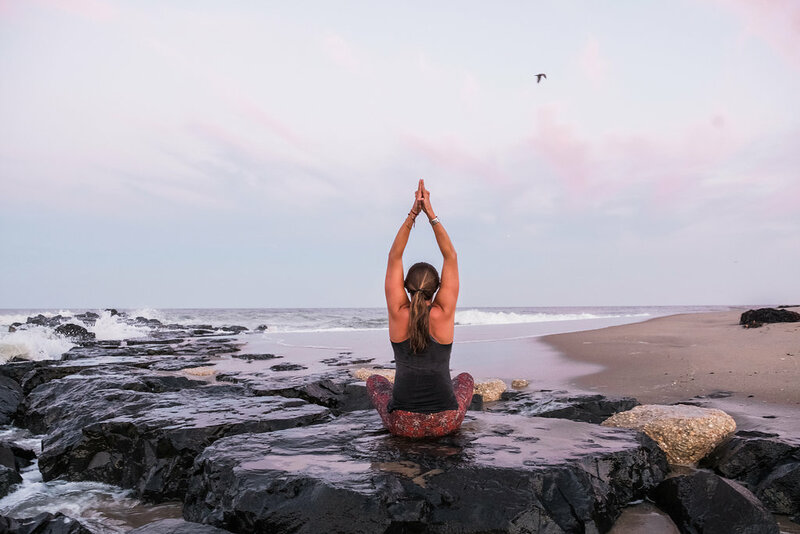 My name is Corey Patricia Thomas, a passionate yoga teacher currently living on the central coast of New Jersey. My first memorable experience with yoga was my freshman year of college. I was in a lot of physical pain from the stress caused by my recent life changes. One afternoon my roommate showed me “child's pose” for the first time. The release I felt in my hips and back as my forehead lay on the old, smelly dorm room carpet was a feeling I will never forget. I recall being amazed that I was able to relieve this tension, naturally. I didn’t start to practice yoga immediately after this, yet I knew there must be more to this helpful process. Years passed as stress and tension built up within my body. I chose to ignore and suppress these feelings until one day I stumbled into a local yoga studio. I left class feeling connected, calmer and simply just happier. I started to cultivate a deeper relationship with my body and my spirit. In May 2014 I attended a 28-day teacher training to deepen my knowledge. I had zero intention of teaching yoga, yet upon finishing the training I realized I wanted to share the joy and healing yoga had given me with others. Yoga has lead me to create a deeper relationship with myself. I have learned how to breathe deeper, care and love my body, track self-mutilating thoughts, and gain more confidence when speaking. I knew I had to share these acquired tools with others who may be seeking healing. Right away I set myself up to volunteer at Turning Point Recovery Center. It is a non profit organization that creates a safe space for those struggling with addiction. The change I saw in my students on and off the mat was indescribable. My time at this nonprofit was so rewarding that I knew I had to continue to help others through the practice of yoga, and that is what I have been pursuing ever since. The experience I have had teaching yoga has been profoundly gratifying. I am excited to bring my knowledge and passion of self love through yoga to those in need of Africa. What is Africa Yoga Project? >In 2007 AYP started in Kenya. The organization uses yoga to cut across lines of race, gender, age and socioeconomic class in order to bring positive change to people’s lives. Since 2007, they have expanded to more than 80 locations, offering over 300 free yoga classes a week to about 6,000 individuals. What can your contribution do? >Your contribution will go to the AYP with will help me support my expenses such as food, transportation and accommodations. What does this journey entail? >Upon reaching my pledge I will travel to Kenya for two weeks. The first weeks theme is 'receiving'. I will experience this by observing, attending and assisting in various outreach settings. This could be at a school or even a prison. The second weeks theme is 'giving'. This is where myself and the other Ambassadors share their strengths and skills with the Africa Yoga Project teachers through a workshop. I will be defining my intent and workshop focus within the next couple of months with the help of my AYP team and ambassadors. What is my intent? Why am I embarking on such a journey? -To teach others how to feel better in their skin and love themselves more and more each day. I learned this myself through yoga and meditation and the effects have been life changing. Being able to share my journey and acquired knowledge with others in turn will inspire them to see more gratitude in their life. -To deliver the message to all people, that we all are equal. -To help those that are not as privileged as myself. Helping others ignites my spirit and mends the hoop of the people. Thank for for taking the time to learn about this project. Please consider a donation, every bit helps to make a difference. Corey Thomas 08/16/2018 $40.00 KICKBALL 8.15.18 thanks for coming out! Andrea Wilkolaski 08/07/2018 $30.00 AYP Tank! Best of luck to you on your next journey! Anonymous Friend 08/04/2018 $25.00 Light to all love to all peace to all! Let your light so shine! Anonymous Friend 07/31/2018 $135.00 YogaSoul T-shirt Sales! Corey Thomas 05/18/2018 $340.00 GOAT YOGA! Corey Patricia Thomas 05/10/2018 $1,374.00 BEACH HAUS BREWERY FUNDRAISER!!!!! Thank you to all of you that came out and support this event!!!! Corey Patricia Thomas 05/10/2018 $40.00 from Lynn and Cathy! James England 05/03/2018 $30.00 Africa Yoga T-shirt!!!!! Megan Harmon 05/02/2018 $50.00 Good luck in with your goal!!! Cindee Rifkin 04/30/2018 $50.00 Your beautiful light helps others see and shine their own. Thank you for listening to what your Spirit dictates, we are blessed to have you in this world to serve others. You are my constant inspiration. I love you!!!! Andrea Wilkolaski 04/29/2018 $25.00 Go Corey! Suzanne Rogalsky 04/27/2018 $40.00 In love and support - and I want to go back to Africa - lol!! Matt Heasley 04/20/2018 $20.00 Love You! I'm sending you all my best energy for your amazing adventure! Christine Murphy 09/23/2017 $10.00 Best of luck Corey! It sounds amazing!!! Krissy Williams 08/16/2017 $15.00 This is awesome. Best of luck with you and your endeavors!